A subpoena for written records is called a subpoena duces tecum. Subpoena duces tecum can be issued by an attorney directly, or by the judge through the clerk's office. A subpoena orders the person (called an affiant) to appear, while the subpoena duces tecum requests documents for review. Note that if the documents are voluminous, the affiant can provide access at a specific location for you to visit and review and the affiant may also request reasonable copy fees for record production. 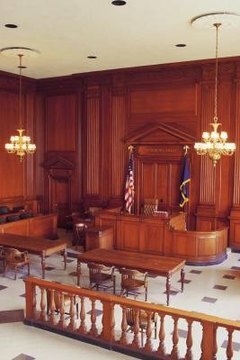 Obtain a subpoena packet from the clerk's office in the county courthouse where your case is currently pending. While forms vary from state-to-state, generally you will complete the forms in the packet by including the pending case identification information in the subpoena header, and then complete the appropriate subpoena duces tecum form, detailing the item you wish to be brought. Complete the Motion for Subpoena form, the Subpoena Duces Tecum and the Order of Issuance form for the court's convenience. File your motions with the clerk's office in the county courthouse where your matter is pending. The clerk will provide you information on getting the subpoena duces tecum signed and issued, since in some states the subpoenas are issued by the clerk's office. Serve the subpoena on the affiant via a special process server such as the county sheriff. Review the affiant's production pursuant to your subpoena duces tecum. If your request was to a business, and not an individual party, then the return of your subpoena duces tecum should also include an affidavit that the document produced is a true copy which is responsive to your request as well as that the records were copied by the affiant personally or at his direction in the regular course of business. Pandova, Sameca. "How to Subpoena for a Document." , https://legalbeagle.com/8530752-subpoena-document.html. Accessed 19 April 2019.